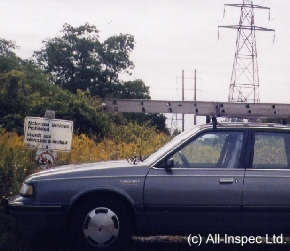 Magnetic Hill - Burlington, On. Magnetic Hill is on King Road a few hundred feet north of Bayview Park. See map for details. From Hamilton - 12 km. Take York Road and Plains Road or Hwy. 403 to Burlington. Turn left on Waterdown Road. WARNING! 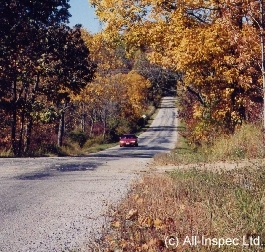 Burlington's Magnetic Hill is a on a section of public road. 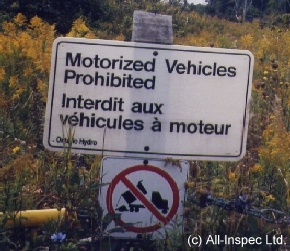 All traffic signs and rules must be obeyed. There is also a blind spot at the 'top'. Cars coming over the crest of the hill cannot see you!!!! Always bring someone to watch for other traffic. Never try the hill when the road is wet and slippery or during inclement winter weather conditions. Do not start at the 'top' but travel 'down' the hill and start at the Hydro right-of-way. Go north on King Road. Pass 1st. 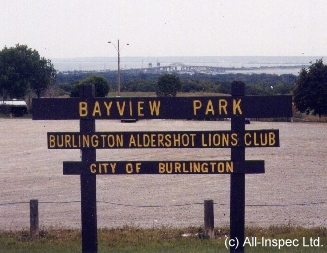 Bayview Park Sign. At the 2nd. Bayview Park sign (pic.#1) the road makes a sharp turn to the right. You will now see the crest of two small hills. Stop at the second one and you are looking down Magnetic Hill (pic.#2). At the bottom of the hill you will see this sign (pic.#3) on the left. ONLY if it safe to do so, turn around here or at a driveway down the road. Stop at the sign. You are now facing south (Bayview Park) and parked at the bottom of the hill (pic.#4). 1. Stop car at Hydro right-of-way entrance. 2. Place car in 'Neutral', turn on four-way warning flashers, check rear view mirror for traffic. If there are no cars coming up from behind, release brakes and start rolling uphill, as if in defiance of gravity. 3. When you come to a stop at the top of the Magnetic Hill place the car in Drive and continue driving down King Road to Bayview Park to enjoy the view of Burlington, the Skyway Bridge and Burlington Bay. The park has a leash free dog run area which may be convenient if you are traveling with a dog.